The Dripping Springs church of Christ has a wonderful group of young people. Our goal is that young people (grades 6th-12th) will establish a faith they can call their own and grow in their relationship with God. The youth ministry strives to fulfill this goal through small groups, devotionals, mission trips, retreats, and social activities. We would love to have you join us for any activity. Come experience Christ and grow in your own spiritual walk. DSYouth provides a place where youth can belong, are challenged to grow in their faith, discover who they are in Christ, and serve alongside one another. We’re convinced that there’s nothing more exciting or satisfying than following Jesus every day of our lives. We want teenagers to experience the peace, purpose, and joy that comes from being forgiven and set free to love God and serve him with all their hearts. We have a team of committed, caring adults who want to help you grow spiritually, emotionally, mentally, and socially. Lads to Leaders & Leaderettes is a tool used by the church in Dripping Springs to provide an effective year-round, Bible-based youth leadership program for our students from Kindergarten through College. We utilize this tool to equip our young people with the knowledge and skills to become Bible school teachers, personal workers, and effective speakers. These youth can then take these talents into communities in need of Christ, even before they graduate from high school. We have programs to encourage Bible study, song leading, public speaking, debate, puppets, and many other categories. We’d love for you to join us! Though many congregations with the L2L program enjoy a more than 90% retention rate of their young people, it is a program that goes beyond helping churches keep their youth faithful to the Lord. This is not just a youth program. It is a congregational program. Using the Bible standard of the old teaching the young, adult mentors assist the youth in training in various areas such as scripture memorization, Bible reading, speech preparation and presentation, debate, Bible bowl and song leading. This gets the entire congregation involved and brings about a spirit of unity. L2L also provides an avenue through which young people can be motivated to become responsible Christian leaders in the home, church, school, and community. Start preparing your young people today to become great leaders! 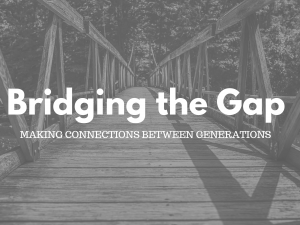 Bridging the Gap will be a very neat time for the teens to unite will the Prime Timers of the congregation. The teens will have a theme for each dinner and will dress up and serve the Prime Timers, and after they have been served we will enjoy a meal with them. The teens will sing, put on skits, and ask questions about the theme. This will be good to mix the different ages to realize we are one in Christ, and age doesn’t separate us. 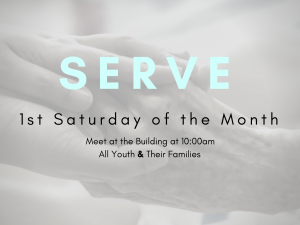 This is a family event that will be for the Kindergarten – High schoolers working together every first Saturday of the month doing a community project. This could range from working on someone’s garden, picking up trash along the streets, food drives, cutting tree branches, volunteering at food banks or animal shelters, etc. This is a great opportunity for the Dripping Springs family to come together, get out in the community and serve. 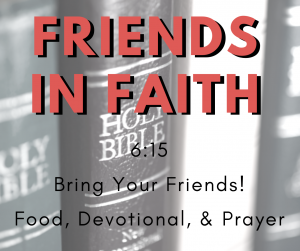 Friends in Faith meets every Wednesday at 6:00 and is an opportunity for our youth members to bring their friends so that they can get associated with the congregation. This is for the youth from 6th grade through High school. We will have a meal, play some quick games, sing some songs, and then transition into our Wednesday night Bible study. 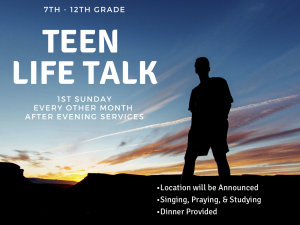 On the 1st week of every month, there will be Teen Life Talk (TLT), or Singing On Sunday (SOS). Teen life talk will be a devotional at a member’s home where we will sing songs, pray, and have a short devotional thought. Sunday Night Out (SNO) will be on the 2nd week of every month and is a night where we can unwind after a day of worship, and go bowling, trampoline park, etc. This will be a great opportunity to bring friends and for the youth group to really connect and bond with each other. On the 1st week of every month, there will be Teen Life Talk (TLT) or Singing On Sunday (SOS). SOS will be an event that will take place at the church building. We will have pizza, gather for lots of singing, and a devotional over one of the songs we sing. 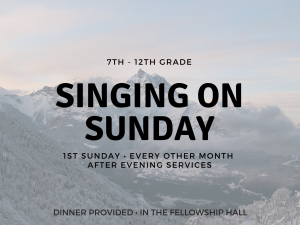 Youth events like these will help the youth in training to sing with each other and worshipping God to their best ability. 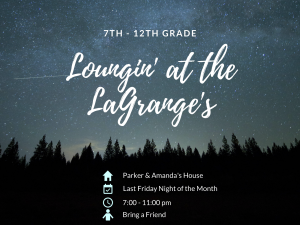 Loungin’ at the LaGrange’s will be a fun event that will take place at Amanda and I’s home for the teens on the last Friday of the month. We will have games, food, scavenger hunts, and lots of fun. This is a night to bring friends and come over for a night to unwind and relax to start the weekend. 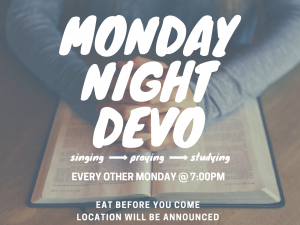 Youth Devos will be every other Monday night at the home of one of the members of the congregation. We will sing, pray, have a short devotional, and hang out with each other to get the week started out right. This will be a spiritually enriching time for all those in grades 7th-12th. 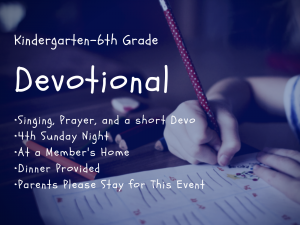 These devotionals will be every 4th Sunday and will be similar to the Monday Night Devotionals. We will have singing, prayers, a devotional by one of the dad’s, and great fellowship. 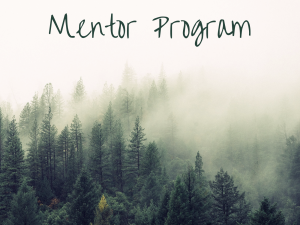 In order to foster better relationships among our elderly and young people, we will begin a new mentoring program in which older members of the church will get paired with a child to mentor throughout the year. They may attend sporting events, encourage them in their Christian walk, and just support them through the school year.